Create Completely Custom Eco-Friendly Bags at Factory Direct Pricing! There has never been a better time to start marketing with custom, eco-friendly bags. 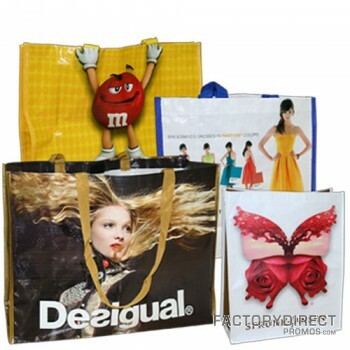 Eco-friendly reusable bags bring a lot of value to your marketing budget and they are in high demand. Bag bans throughout the United States and a reusable design ensure your prospects, clients and customers will be using these bags for many years; so your branding message will be put on display for a long time. You get great ROI when you work with us to order your eco-friendly bags. We work directly with our factory in China so we are able to lock in a great price, which we share with you. Reusable bags are also a much better choice for the planet and her people and animals so you can promote your brand while also helping create a more sustainable future. Want to learn just how easy it is to create custom reusable bags? Keep reading to learn more. Your eco-friendly bags should be big enough to be handy and we are making bigger and bigger bags each year to fit consumer demand. In order to determine the best size of your eco-friendly bags, you should think about how your customers will use your branded bag. The more convenient a reusable bag is, the more often your customers will use your branded bag, and the more often the bag is used the more visibility they will give your brand. The material you use for your eco-friendly bags will send a message. Eco materials make it clear to your clients and prospects that your company is serious about helping the planet, and minimizing your environmental impact. We offer both sustainable and recycled fabrics, so you are sure to find something that fits the look you want. If you need help figuring out the best material for your eco-friendly bags explore the differences between woven and non woven bags. We have a wide array of colors, so you can find something that fits in with your corporate colors and branding. This bag should represent your brand, and by choosing the right colors your reusable bag will be consistent and fit in with your other marketing pieces. If you want your custom bag to have a flashier look choose one of our metallic colors. There is no limit to what we can do with the design of your eco-friendly bags. The third step of the process is where you get to really customize your eco-friendly bags. Choose the handle type and length, add closure like snaps or zippers if you want them, add trim or pockets, or anything else you can think of to make your eco-friendly bags useful. These add ons may seem minor, but this is your opportunity to create a reusable bag that your customers will be excited to get their hands on. When you create a functional reusable bag it will fill a need for your clients. The more useful your eco-friendly bags are the more visibility they will give your brand, so take your time and think through the design of your bag to ensure you build a custom reusable bag that will get lots of use. The fourth and final step of the process is letting us know how to get in touch with you, how many eco-friendly bags you want to order, and if there is anything else you need to let us know. When considering quantity we suggest you round up. If you are handing out bags at an event you do not want to run out early, and the more eco-friendly bags you get out there the more visibility your brand will receive. The more bags you order the lower the price per bag, so in order to secure a great deal you want to order plenty of eco-friendly bags. There has never been a better time to market your business with eco-friendly bags. Create your custom, eco-friendly bags HERE or contact us today!